The vast majority of Seychellois people today are Roman Catholic Christians, a legacy left in the country by past French influences. Saint Paul's Cathedral, a Roman Catholic Church in the city of Victoria on Mahe Island, Seychelles. Seychelles is an African island country located in the Indian Ocean with a population of approximately 93,000. This nation has no known indigenous populations. Instead, a long history involving Arab traders, British traders, pirates, French colonizers, indentured servants, and slavery has resulted in the multi-ethnic population that resides here today. Its history of diversity can also be seen in the wide variety of religious identities on the island. These are discussed below. The French claimed these then-uninhabited islands in 1754 at the beginning of the Seven Years War waged by them against England. They brought with them the Roman Catholic religion which today is the most widely practiced in the country. Approximately 82% of the residents here today identify as Catholics. Until 1944, the vast majority of schools operating here were of Catholic curriculum, a fact that helped to cement identity with the religion. Church attendance is relatively high here particularly when compared with western countries. Classicism attitudes left over from colonial times gives those individuals who are both Catholic and French-speaking a somewhat higher social status. In the early 1800’s, the British began taking control of the islands. They brought with them missionaries in order to spread the word of the Church of England. With Catholicism as the already established, dominant religion, they were not as successful as hoped. Today, 6% of the population identifies as Anglican Christian. Other forms of Christianity seen in Seychelles today include Protestants, Pentecostals, Orthodox, and Seventh-Day Adventists. Around 5% of the population identifies as one of these other Christian followers. Many Christian denominations, including those previously mentioned, tend to mix traditional religions with Christian beliefs. This includes visiting healers and fortune tellers and believing in magic and spirits. The number of Hindu practitioners has grown over the years, currently accounting for 2% of the population. In 1901, there were only 332 Hindu families living on the islands. Since the Navasakthi Vinayagar Temple was consecrated in 1992, this religion has seen exponential growth. In fact, between 2002 and 2010, the number of followers increased by 500. The Seychelles government, though largely Catholic, has even declared a Hindu festival as a national holiday. Muslims make up only 1% of the population. What is most interesting in regard to this fact is that followers of Islam were spreading the religion throughout the Indian Ocean long before European colonizers arrived. Islam is the majority religion in several island nations including Comoros, Mauritius, Zanzibar, and the Maldives as well as along several African countries on the coast. However, Seychelles was largely ignored until the 1700’s when the French settled here which allowed for the spread of Catholicism. The government here, true to its acceptance of varying religions, permits 15 minutes of Muslim public broadcasting on Fridays. 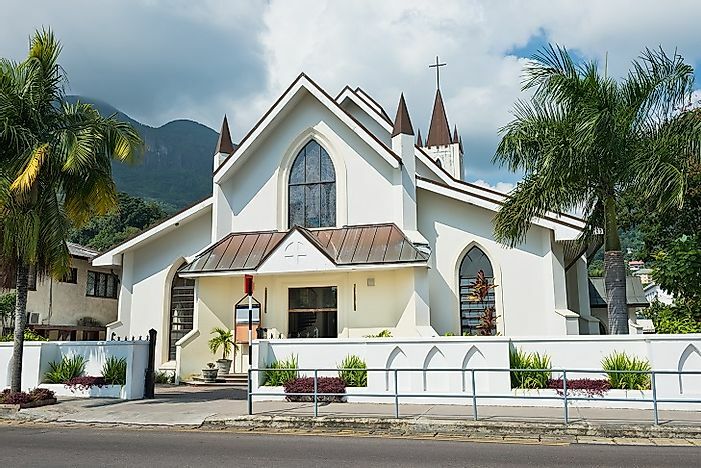 Given that atheism and agnosticism are typically associated with large urban centers and areas with access to higher levels of education, it comes as little surprise that these religious identifications are not very common in Seychelles. This country is largely rural and has a high population of under-educated individuals with many not completing basic elementary. Only 1% of the population identifies as Atheist or Agnostic. Other religions one may see being practiced when in Seychelles could include Buddhism, Judaism, Mormonism, and traditional beliefs. Approximately 3% of the population collectively falls into one or another of these practices.